Respect people’s time: Put offers in the subject line. That’s right, fifty-five characters or less. If you’re sending someone a single coupon or offer, put the info up front so that you can stop them at the subject line if they don’t want any of it. Let them move on if they’re uninterested. There’s a Time for Clever. This Ain’t It. Ah, you creative genius, you. Your prose is pro and your words are gold. Can you just give it a rest for today, word-master? Save it for a scrabble game. People are very busy these days. They’ve already honored your indulgence by signing up for your on-some-days-annoying list, why waste their time beating around the bush if you’re only sending a single offer or coupon? If you want to be clever with your subject line, write an amazing and informative, content-driven newsletter. People like those a few times a month, but not as often as you’d like to market to them. Yet people always want those discount offers for some reason. Do you think anyone wants to read, “Don’t miss this very special email offer,” only to open up a pesky 10%-off-a-thing-I-don’t-want coupon? No. It might even be a great offer, like a half-price thing-a-ma-whatever, but it’s no bargain if they don’t want it. 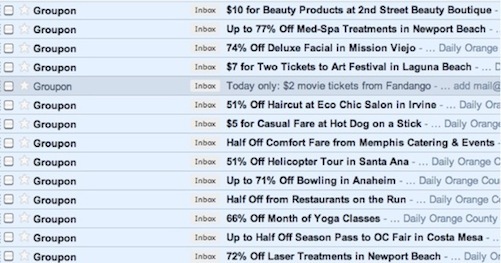 Remember, your email offer won’t appeal to everybody on your list. That’s okay. If your offer is good enough and it’s what someone needs or wants, they’ll surely open up your email. And now you wow them with your pretty coupon that you built on that great email promotion template. If it isn’t what they want, your message is tolerated even if it’s unopened. If I were going to explain this to my wife, I’d say to think of that subject line as a mall shop’s window. You know by what the mannequins are wearing if you really want to enter. If I were explaining this to my imaginary cousin in Nashville, I’d say to always wear your cowboy hat if you want to meet a country music lovin’ girlfriend. Better for you and all the other women in the world that they pass you by if they don’t ever want to hear your Toby Keith CDs once they get to know you. Or I could just be direct.